Tired parents … crying baby … tired parents … crying baby. It doesn’t have to be that way; the cycle can be broken! As a new parent your upmost priority is to meet your baby’s needs. Their needs are simply enough milk, enough sleep, lots of love and solving their problems when they are crying. All the parents that I have met over the years are dedicated and loving and simply want to do what is best for their baby regardless of what this means to them as a parent and their lifestyle. Their baby comes first. “Slippery slopes” such has being caught in the cycle of having to rock and pat a baby until they are fully asleep. We have all unfortunately seen parents in these situations and as an expectant parent mostly you cross your fingers, hope that this doesn’t happen to you, hope for the ‘good’ baby and wonder if you made the right decision in having a baby. Other slippery slopes include driving your baby around in the car to get them to sleep. Parents juggling a baby while they each eat dinner, as they can’t put their baby down, as the crying will start again. Having a screaming baby that screams for hours at a time and trying 101 solutions to solve the crying. What if the crying never started in the first place? What if there was another way to parent? What if your baby could be given a cuddle placed in their cot and drift peacefully off to sleep on their own? Education about their baby’s needs is life changing for parents; the strategies are simple and easy to understand. The common comment from parents is that this information is logical and easy to see once someone has pointed it out and explained it to you. Parents then feel confident in meeting their babies needs and have an outline of what to aim for and it is with these strategies and their confidence that they can make decisions everyday to assist their baby and meet their needs. Their baby is then happy, cries very little, well fed, well loved and sleeps deeply and wakes happy. As a result undoubtedly parents enjoy being parents and love the changes that a new baby has bought to their lives. Above all, a very strong bond and loving relationship is formed between parents and baby and this is privilege to see. The place to start is to learn about what your baby needs on a daily basis to that they have enough milk and enough sleep. These are the essential building blocks to meeting your baby’s needs and having a happy, content baby. This is a routine. A routine is not strict to the minute; it is an outline of what to aim for. I can say that I have seen numerous parents in crisis with a 6 to 8 week old baby and once I teach them the routine and they start, within days both baby and parents are so grateful and their baby’s mood changes overnight. Therefore, it is so much better to start at the beginning on the right track when you return home from hospital. You will notice these stars throughout this book, I have done this to draw your attention to the main points – these points are all the must-do bits – a very quick summary if you like. So take note of these stars and remember these strategies – they are the essentials of meeting your baby’s needs. 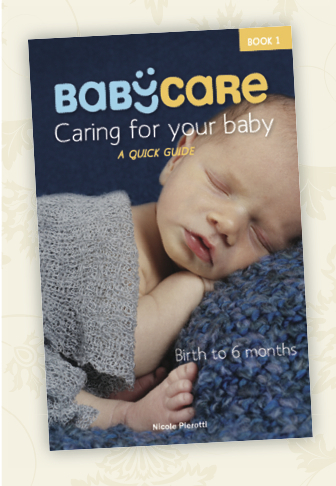 Hundreds of content parents have said that Baby Care was their saviour and have bought it as a gift for expectant friends.